St. Michaels 2-11, St. Marys 1-10. Dáithí Regan grabbed two goals as St. Michaels captured the A FL Division 4 title with an extra time victory over St. Marys at Walterstown on Sunday. The Carlanstown / Kilbeg side led by 1-6 to 1-2 at half time but were forced into extra time by an impressive St. Marys recovery, but the Donore men’s efforts fell short in the added period. David O’Connell, John Clinton, James Farrell 0-1, Philip Rogers, Sean Gaffney, Derek Flood, Dáithí Reilly, Matthew Reilly 0-1, John Sheridan 0-1, Nick O’Kane 0-1, Dáithí Regan 2-2, Felim O’Reilly, Johnny Reilly, J. B. O’Reilly 0-1, Ciaran Lynch 0-3. Tom Halpin 0-1 for J. B. O’Reilly, Sean Cassidy for Clinton. St Michaels 2-11, St. Marys 1-10. Sunday September 24th 2006 in Walterstown. With eleven games to play in the league campaign, matches started early in the year and were then fitted in between championship outings. As expected, St Michaels topped the table from a very early stage and remained there right until the end. Blackfort Gaels 3-10, Dunderry 1-14. Graham Owens claimed a late goal and a last minute Stephen Kiernan point secured victory for Blackfort Gaels in a thrilling MFC division 3 quarter final under lights in Carnaross last Wednesday evening. The St. Michaels / Kilmainhamwood combination led until 5 minutes from the end when Dunderry edged ahead by two points, but a wonderfully committed effort enabled Blackfort to regain the advantage with those late scores. Andy Coogan and Aaron Newman each scored six points for Dunderry and Jordan Martin rifled a fine shot to the net but despite the efforts from Andy McGeough, Fergal Maguire, and Bob Doherty, it wasn’t enough on this occasion. Robert Briody, Sean Cassidy, Paudie Owens and Philip Moran were prominent throughout for Blackfort Gaels. J. Carolan, Philip Rogers, Mark Cassidy, Sean Cassidy, Mark Stafford, Robert Briody, Ciaran McCormack, H. Corbally 0-1, P. Owens 0-1, Graham Owens 2-2, P. Moran 1-0, Darren O’Connell 0-1, S. Kiernan 0-5. S. Mooney, F. Maguire, A. McGeough, P. Fitzpatrick, C. O’Farrell, G. Fitzpatrick, A. Newman 0-6, B. Doherty 0-2, D. Gilkeson, A. Coogan 0-6, E. Dempsey, F. Moran, L. Dempsey. T. Feeney for Fitzpatrick, D. Clarke for O’Farrell, J. Martin 1-0 for Gilkeson. Blackfort Gaels 3-9, Clann na nGael 1-13. Sunday November 29th 2006 in Moynalty. Two goals from full-forward Graham Owens helped Blackfort Gaels to victory over Clann na nGael in the MFC Div. 3 semi-final in Moynalty on Sunday. The St. Michaels / Kilmainhamwood combination led by 2-5 to 0-4 at the break, but Clann na nGael responded well as Gavin Browne, Davy Williams, Kieran Smith, Damien Tuite and Darren Molloy impressed. However Blackfort dug deep and with Ciaran Lynch in inspirational form, well aided by Philip Rogers, Robert Briody, Harry Corbally and Padraig Owens, they held on. J. Carolan, Philip Rogers, Mark Cassidy, Robert Briody, Mark Stafford, Sean Cassidy, Ciaran McCormack 1-0, H. Corbally, P. Owens 0-1, Ciaran Lynch 0-4, P. Moran, Graham Owens 2-1, S. Kiernan 0-3. D. O’Griofa, S. O’Mealoid, G. Browne, D. Kelly, O. Potterton, C. Duffy, B. Quirke, D. Williams 0-3, O. McCole, K. Smith 0-1, C. O’Congaile, D. Tuite 1-3, D. Molloy 0-1. S. McDonncha 0-4 for Duffy, S. Ennis 0-1 for Quirke, J. Daly for Ennis. Blackfort Gaels 1-11, Na Fianna 1-10. The concession of an early goal proved proved to be just a minor obstacle as Blackfort Gaels recovered to claim the MFC division 3 crown with a narrow victory over Na Fianna on Saturday. Shane Geraghty’s goal gave Na Fianna an ideal start, but the St. Michaels / Kilmainhamwood combination proved too hot to handle especially with the wind at their backs as they fired over seven points before Ciaran Lynch rattled in a goal to ensure a 1-7 to 1-5 interval lead. In a low scoring second half the midfield combination of Harry Corbally and Ciaran McCormack did enough to deny Na Fianna good possession to exploit their wind advantage. Philip Rogers and Mark Stafford showed up well in defence for the winners while Paudie Owens and Graham Owens excelled in attack. J. Carolan, Mark Cassidy, Philip Rogers, Robert Briody, Mark Stafford, Sean Cassidy 0-1, Ciaran McCormack 0-1, H. Corbally 0-1, P. Owens 0-2, Ciaran Lynch 1-3, Darren O’Connell, Graham Owens 0-1, S. Kiernan 0-2. P. Moran for O’Connell, Alan Dolan for Kiernan. St. Michaels 5-9, Clonard 1-4. 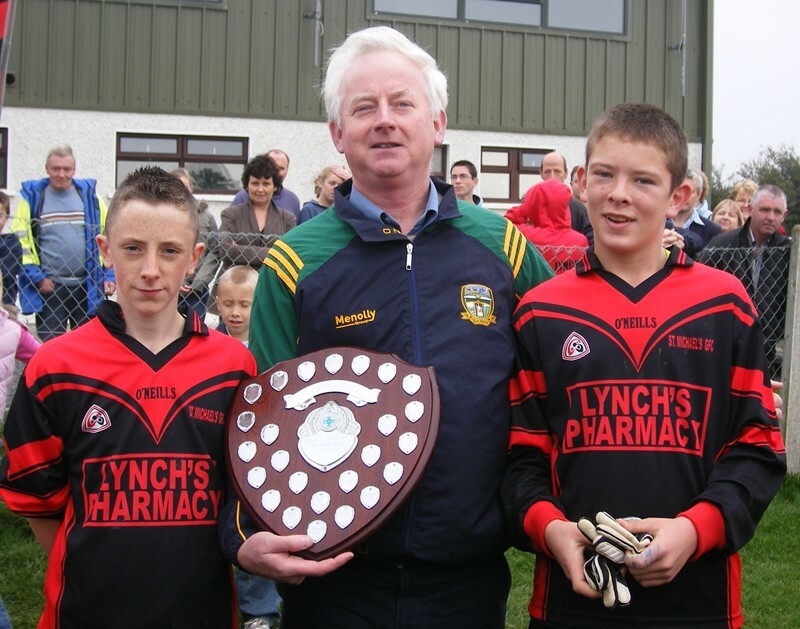 St. Michaels took the U-13 FL division 4A title with a fine win over Clonard on Saturday afternoon last in Bohermeen. Paul McCormack, Leanne Lynch, Michael Murphy, Sam Briody, Megan O’Brien, Jordan Moran, Jamie Farrelly 1-3, Stephen O’Brien 1-2, Daniel Murphy, Ollie Reilly, Peter O’Connell 0-4, Gary Dolan 1-0, Ronan Lynch 1-0. John O’Brien 1-0, Jamie Reilly, Fiona Drew, Dean Moran, Craig Curtis. Photo’s courtesy of Declan Lynch. ST. MICHAELS CRUISE TO JUNIOR TITLE SUCCESS. St. Michaels 3-21, Wolfe Tones 2-3. Sometimes there is just no accounting for class as Wolfe Tones discovered to their detriment at Simonstown on Sunday where Gillian Bennett inspired St. Michaels to the ladies JFC title with a magnificent performance. Bennett finished with a personal tally of 1-13 and she was involved in so many other scores as the Carlanstown girls signalled their intentions with a powerhouse display. There was a huge amount of sympathy for Wolfe Tones at the final whistle. To their credit, they never gave up, but they were simply outclassed by a vastly superior St. Michaels side that included a number of former inter-county players. Bennett was the undoubted star of he show with her ability to kick points off both feet and also her awareness to create opportunities for others. However the former Meath star was not the only one to shine for St. Michaels. Lisa Keenan and Elaine Lynch were instrumental in much of the good work the winners did and with Rose Gilsenan, Lisa Lynch and Mary Clinton in fine form at the back they ensured that Wolfe Tones chances were few and far between. Wolf Tones did enjoy a few brief moments throughout the contest when they had the upper-hand, Irene Munnelly was their best player and when she was in possession St. Michaels were pinned to their collar to restrict her. However, for the vast majority of the game and despite the honest efforts of the Wolfe Tones players, St. Michaels were in a different class and never looked in danger of slipping up. Megan O’Brien was constant thorn in the Wolfe Tones side. Her exciting jinky runs proved to be a handful and with Fiona Nevin, Helen Finnegan and Aisleen Regan also doing well, St. Michaels had plenty of firepower. The game was action packed and free-flowing. There was plenty of brilliant scores, most notably from Bennett, and the levels of fitness from both sides should be applauded, but St. Michaels were the classier outfit. Bennett and Regan gave St. Michaels an early lead, but Wolfe Tones responded positively and went ahead when Aisling Whelan took advantage of a collision between Lisa Lynch and Michelle O’Connor and finished to the net with no difficulty. That goal proved to be a false dawn as St. Michaels took a grip in every sector of the field. Bennett rifled over three points and after 12 minutes she showed great vision to set up Nevin for a brilliantly worked goal and a 1-5 to 1-0 lead. From the kick-out Elaine Lynch won possession and laid off to Bennett who put the game beyond doubt with a superb goal. Bennett added three more points, Keenan kicked two and Leanne Lynch also got in the act as St. Michaels lead by 2-11 to 1-2 at the break. Munnelly pointed two frees to complete Wolfe Tones first half tally. After the resumption the onslaught continued. O’Brien’s speculative shot looped over Deirdre Ward for St. Michaels third goal and by the 38th minute that lead had increased to 3-15 to 1-2 with points from Bennett ( two ), Finnegan and Nevin. Munnelly added some respectability to the Wolfe Tones scoreline with a cracking goal from over 25 metres, but St. Michaels were always in control and could afford to give five substitutes a run. Bennett added four more points in the final quarter while Mandy Carr and Keenan also pointed to complete the route and spark huge celebrations among the large Carlanstown contingent. St. Michaels: Donna Lynch, Marita Rogers, Rose Gilsenan, Sinéad McCormack, Lisa Lynch, Mary Clinton, Mary Smith, Lisa Keenan 0-3, Elaine Lynch, Megan O’Brien 1-0, Gillian Bennett 1-13, Fiona Nevin 1-1, Leanne Lynch 0-1, Helen Finnegan 0-1, Aisleen Regan 0-1. Subs: Mandy Carr 0-1 for Finnegan, Sharon Mooney for Leanne Lynch, C. Stafford for Nevin, Therese O’Brien for Rogers, A. Gargan for Smith. Wolfe Tones: D. Ward, J. Smyth, U. Brady, A. Lally, R. McGrath, L. McKeever, D. Markey, P. Lally, I. Munnelly 1-2, E. Shaw, S. Noonan, A. Whelan 1-1, M. O’Connor, E. Ross, I. Cooney. Subs: S. Farrelly for Brady, B. Ward for O’Connor, A. Coole for Ross, S. Markey for Shaw. Report from: Fergal Lynch for The Meath Chronicle September 8th 2007. There was a time in the distant past that St. Michaels were the queens of ladies football. Their fall through the ranks was more of a plummet, but the signs of recovery were ominous at Simonstown on Sunday. A 21 point JFC final win over Wolfe Tones reflected more than just a spectacular victory, it has signalled that St. Michaels are on the verge of a return to the big time and in their current irrepressible form they will take a lot of stopping. THE hunger and commitment shown by the players and management of the club has contributed to step one of their goals being achieved. Manager Peter Murtagh was delighted with the attitude shown by his players and praised the club for their dedication to ladies football. “I’m thrilled with that result and I’m delighted for the girls because they have put some effort in since St. Michaels ladies decided to reform. I was asked to be coach and when I saw the type of players who were interested in playing I said why not”, said Murtagh. “ I could see, back in January, that this was a winning team. On a frosty night in Carlanstown in January we had 32 players looking for a training session and I think these girls mean business, today is a result of that commitment and hard work, there is also great work done along the sideline with Gerry Kealy and especially Christy Regan, Christy is a gentleman and a legend and a pleasure to work with. He has done so much for St. Michaels football and now the ladies have the pleasure of his guidance”. “As a manager I’m proud of everyone and I’m delighted with the backroom staff, on the day the scoreboard said it all, but I have a lot of sympathy for Wolfe Tones”. “ We played them in a league game and they were the better team and we were fortunate to win that day, however, today was a great day for St. Michaels “, he said. Being able to call on the exceptional talents of Lisa Keenan, Elaine Lynch and Gillian Bennett was a huge boost to Murtagh and with that vast experience and skill available St. Michaels will continue to be a force to be reckoned with. “ Gillian Bennett is a legend, she even kicked two points with her right foot today. I saw her playing in New York a few years ago and I thought she was a girl with immense talent,” commented Murtagh. “Gillian was one of the girls who convinced me to come to St. Michaels. She is a superb player and she proved that and with no disrespect to the county team I just wonder how can they do without her”. “It is all about getting back to senior football now. The grass-roots of football is the younger players. People like Megan O’Brien and Leanne Lynch who are 14 and 15 years old are the Gillian Bennett’s and Elaine Lynch’s of the future”. “We have great players and the success we have today will bring on more success. St. Michaels is a breeding ground for football and hopefully this will keep going and going. 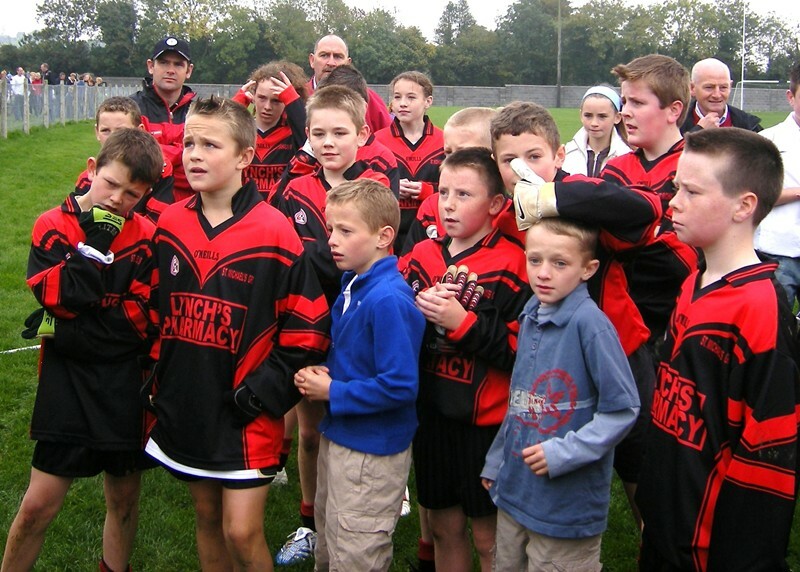 St. Michaels were always a great team in the past and those days are coming back to Carlanstown”, concluded the coach. 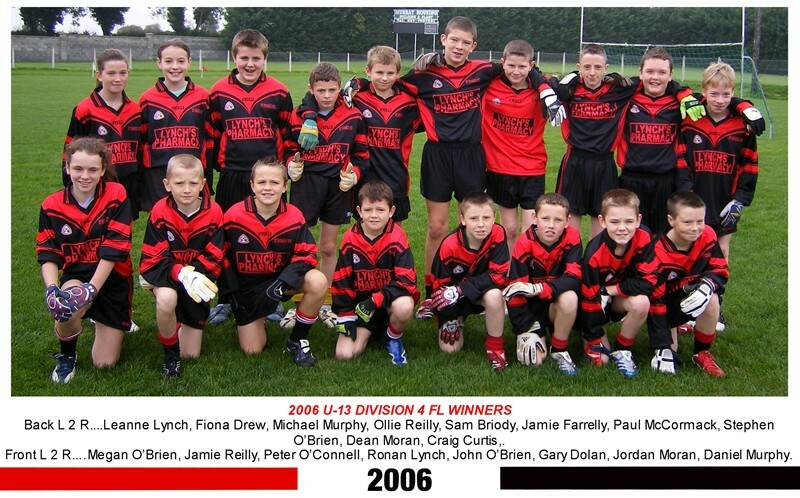 2007 Ladies Junior FC final. Half time: St. Michaels 2-11, Wolfe Tones 1-2. 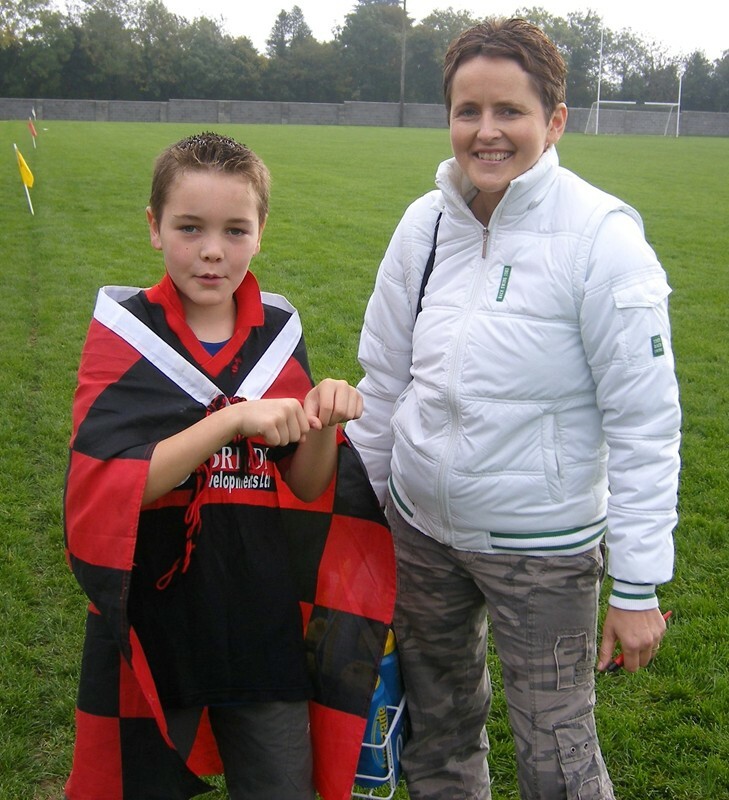 There was plenty of red and black flags around Carlanstown and Kilbeg in the Autumn of 2005 when St. Michaels men won the Junior Football Championship and there was a fair amount of colour this year too as the club’s ladies scored a thoroughly merited victory in their Junior Football Championship. St. Michael’s were a major force in the ladies’ game in the past and on the evidence of their runaway final victory over a gallant Wolfe Tones team at Simonstown in early September, they could well be set to steadily climb back up to the top once more. This was a tremendous success because it was their first year back competing in ladies’ football. When referee Tom Lorton sounded the final whistle there were scenes of jubilation and then captain Aisleen Regan received the cup from Ladies’ County Board chairman David Dempsey. Party time had arrived and rightly so after the great effort that went into winning the title. The St. Michael’s team in the final was – Donna Lynch; Marita Rogers, Rose Gilsenan, Sinéad McCormack; Lisa Lynch, Mary Clinton, Mary Smith; Lisa Keenan (0-3), Elaine Lynch; Megan O’Brien (1-0), Gillian Bennett (1-13), Fiona Nevin (1-1); Leanne Lynch (0-1), Helen Finnegan (0-1), Aisleen Regan (0-1). Subs – Mandy Carr (0-1) for Finnegan, Sharon Mooney for Leanne Lynch, C. Stafford for Nevin, Therese O’Brien for Rogers, A. Gargan for Mary Smith. From the Hogan Stand Royal County Meath Yearbook 2007. St. Michaels 1-10, Ballinlough 1-5. St. Michaels had a number of games in hand in their Division 3 FL campaign and their good form from the championship carried over as they confidently put together a string of performances which saw them clinch a top two finish at the expense of Nobber. Reilly fisted a Dáithí Regan delivery to the Ballinlough net to leave it 1-7 to 1-4 and the Carlanstown/Kilbeg side were never subsequently reeled in but had to withstand considerable pressure in the latter stages that included nearly four minutes of stoppage time. St Michael’s were back on level terms by the 12th minute before Ballinlough kicked on with Peadar Byrne placing Derek Muldoon for a goal six minutes later. Darren O’Connell; Tommy Moriarty, Derek Flood, Dáithí Reilly, Michael Rogers, Philip Rogers, Sean Gaffney, Felim O’Reilly, Brendan Ryan, Ronan Farrell, Ciaran Lynch 0-3, 1 free, Johnny Reilly 1-0, Ben Farrell 0-1, Peter Clinton, captain 0-1, Dáithí Regan 0-5. J. B. O’Reilly for Ben Farrell, Matthew Reilly for Gaffney, Tom Halpin for Johnny Reilly, Ciaran McCormack for Felim O’Reilly. 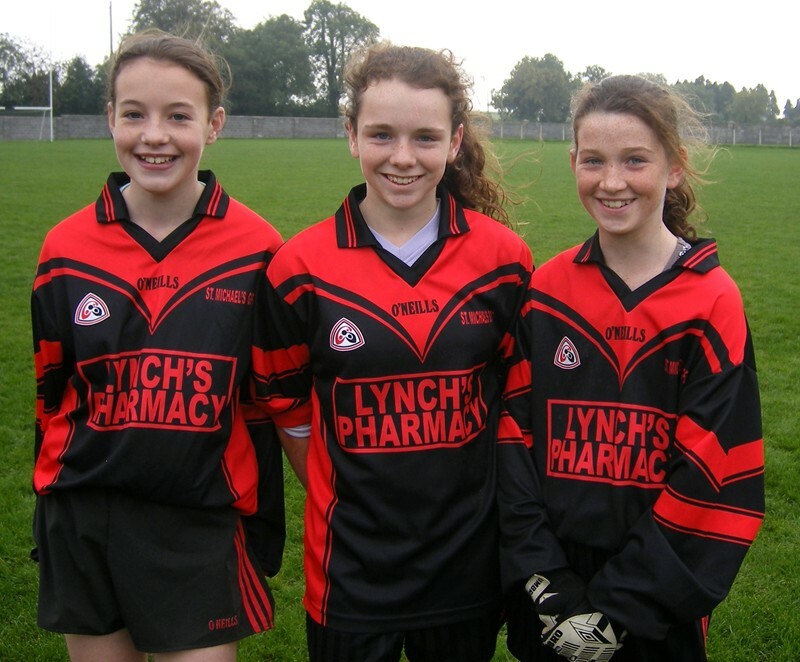 The St Michaels ladies team made another big leap up the ladder of progression in 2008 when they won the Intermediate Championship a year after they had claimed the junior title in highly impressive fashion. Laura Yore, Therése O’Brien, Rose Gilsenan, Sinéad McCormack, Lisa Lynch, Elaine Lynch, Mary Smith, Lisa Keenan, Mary Clinton, Megan O’Brien 0-1, Helen Coldrick 0-2, Fiona Nevin 1-0, Leanne Lynch 0-1, Gillian Bennett 0-4, Aisleen Regan 1-0. Subs – A Gargan for Coldrick, C Stafford for Leanne Lynch. On Sunday October 5th 2008 we all headed off to Cabinteely on Michael Tully’s Coach to play Foxrock/Cabinteely in the first round of the Leinster Championship, the girls put in a tremendous performance, unfortunately the same cannot be said for the referee on the day and we went down on a scoreline of St. Michaels 2-8, Foxrock/Cabinteely 3-14.